I remember the day. The exciting day almost 2 years ago when having just passed the 20 weeks stage of pregnancy, we put together the cot ready for our second little lady to enter the world. The day that made it feel so much more real. 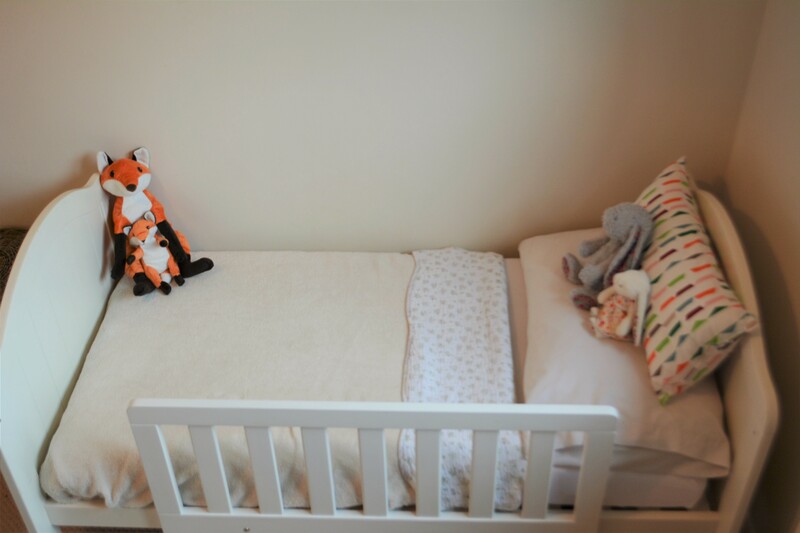 We had a nursery, it seemed so exciting yet so surreal. 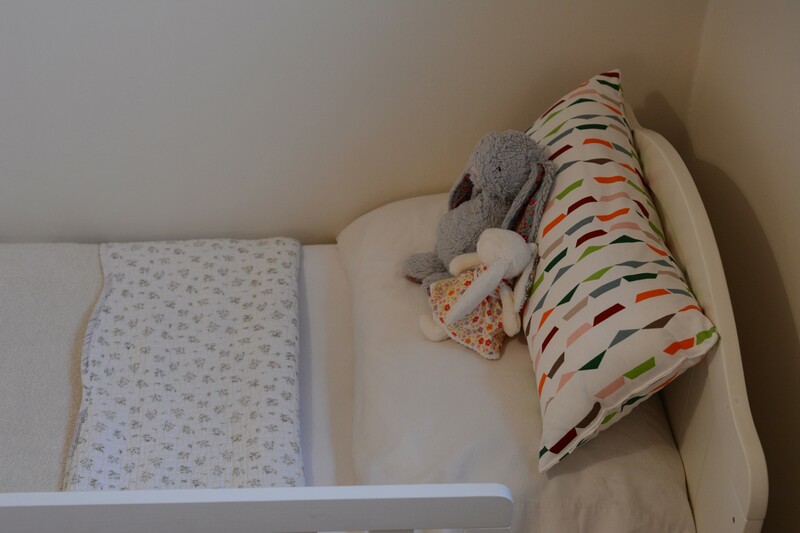 Of course we didn’t really need to, we had a beautiful moses basket snuggled up close to the side of my bed perfect for my little bundle for those first few months. Those evenings where I could pop her down and stare at her when I should be sleeping because she was just so utterly perfect and I couldn’t believe I made her. And perfect for those middle of the night feeds where I could hear as she snuffled hungrily, sleepily transfer her onto me to satisfy that hunger before wrapping her up and placing her back, but not before an extra cuddle. I knew then that these days would go fast, that it was lovely to have the room ready but that I was really in no rush for her to be in there. But I didn’t realise quite how fast. See this little lady had other ideas. 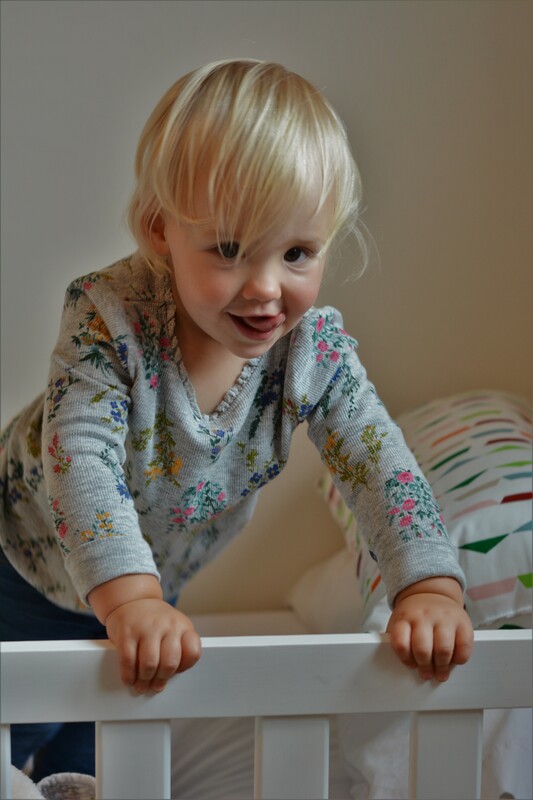 In order to keep the bedtime disruption to a minimum and not make Eva think she was missing out on anything, after a long feed I would pop my little Roma Rosie in her cot as I put Eva to bed and then scoop her up to take downstairs with us. Except she really quite liked it in there. 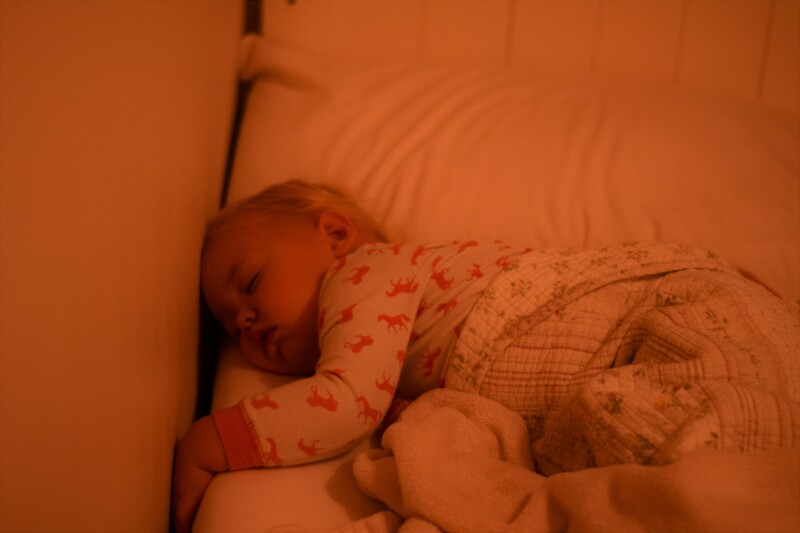 She would fall soundly asleep and it fast became her most settled time. At only a few weeks old she would sleep from 7 till about 10 when I would bring her in the room with me, slowly this stretched out longer and longer. This girl loved her cot. As anyone who has read here before will know this perfect little sleeper didn’t last that long. I so vividly remember that at 16 weeks she rolled, she went from a baby that slept from 7pm until 5am, having a feed and then going back off till 7/8am, to a baby that didn’t like the moses basket at all and that couldn’t settle or stay asleep consistently. We haven’t had the best ride when it comes to sleep with this little one. She seems to go from one thing to another and whilst she isn’t the worst and she does often sleep soundly for 12 hours – like last night. She just isn’t as settled as her big sister was, she isn’t as happy as I would want her to be. And of course that means that I never know how much sleep I will get on any given night! 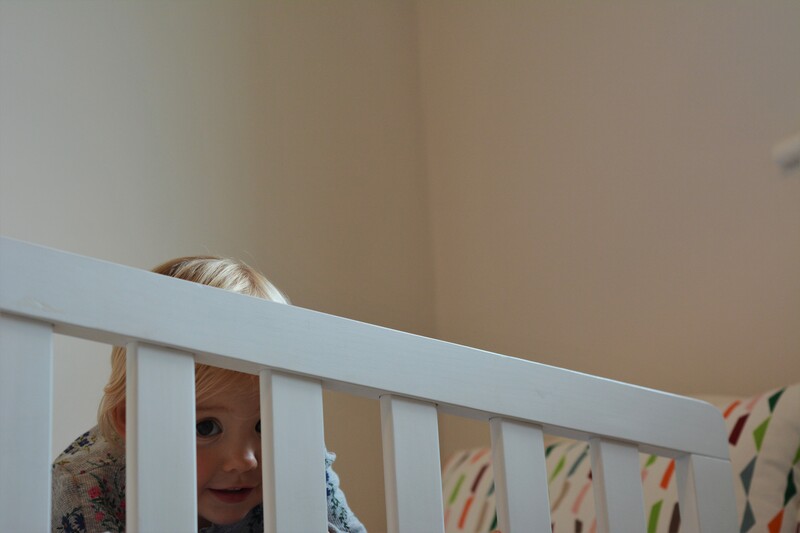 For a while now we have been talking about whether she needs to be in a bed rather than a cot. As she walked at 9 months she is more than physically capable of it and loves nothing more than to lie on her big sisters bed. But then because she is so physical we worried that she would be a child that got up and wandered in the night, that would wake me by her standing at the side of my bed and frighten me half to death or shouting “Wakey Wakey” at 3am. 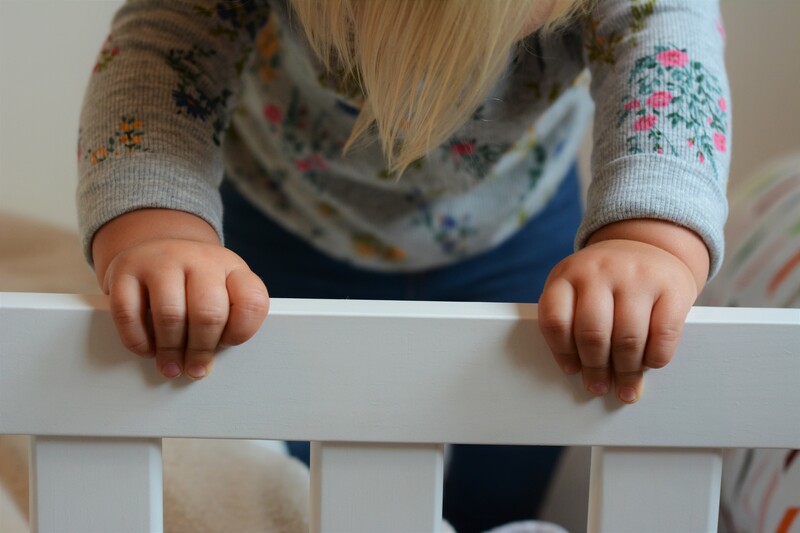 Alas we decided that it was probably time to try, whilst I always like to treat my children as individuals with different needs, and actually thought I would want to keep my last little one as a baby for that little bit longer. 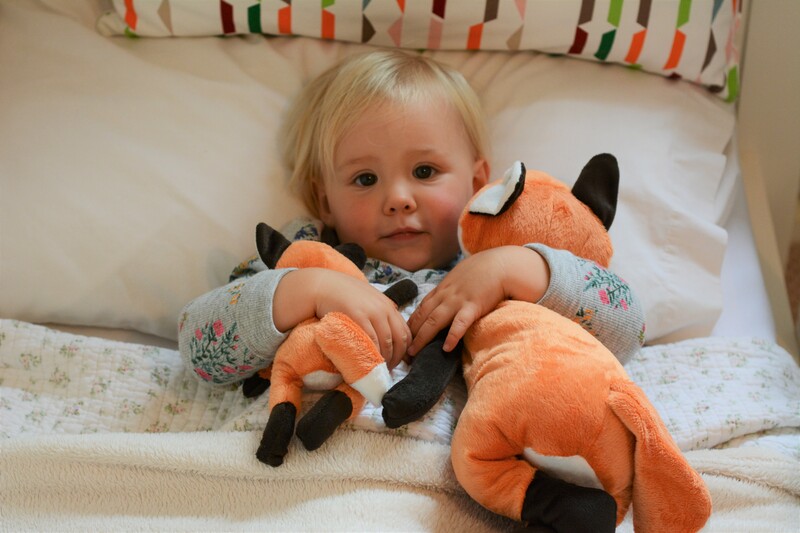 Eva was in a bed by the time she was 18 months so I felt confident that it could work. And also willing to accept that if we needed too, we would re-build the cot at midnight! 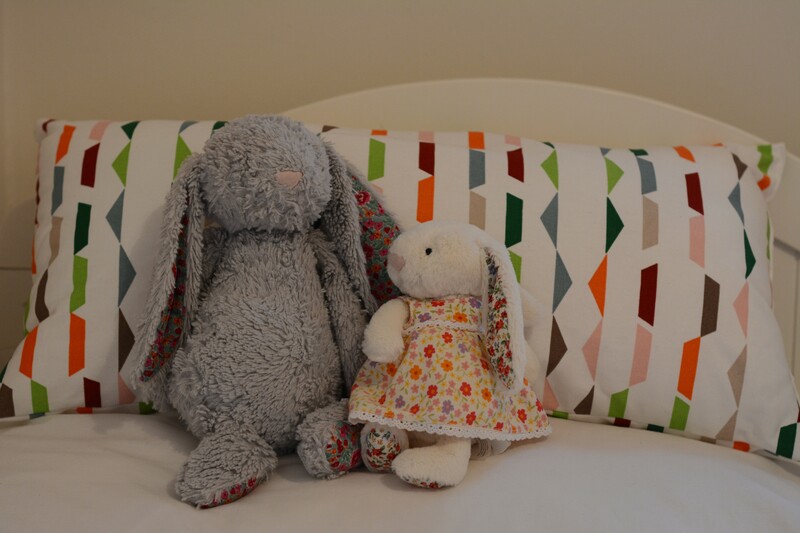 My husband is very much a ‘get on and do it’ kind of a person and no sooner had we talked about trying then on Sunday morning I went for a bath with a cot standing in what could still firmly be classed as a nursery, and got out to what seems so much more like an actual big girls bedroom. All traces of those baby days in this house are now behind me. And as much as I look forward to the amazing adventures ahead, I look back with the fondest of memories. 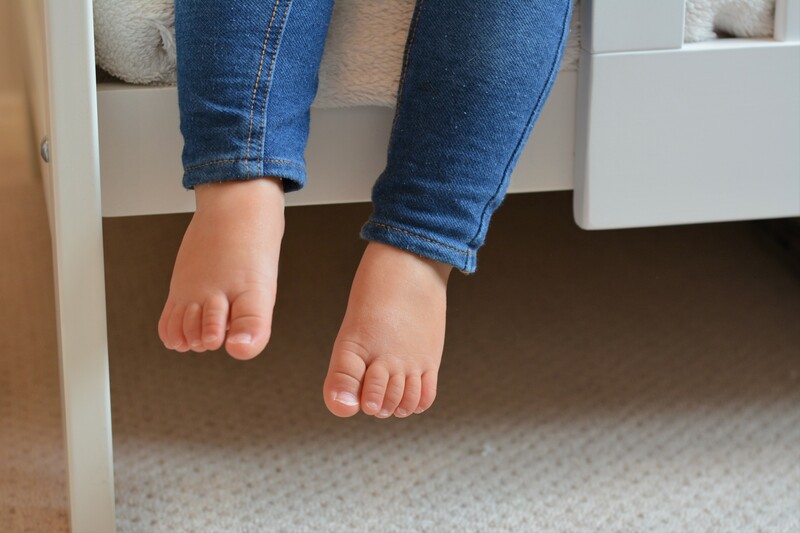 I sit in the chair in the corner of her room, looking at this toddler bed and get flashbacks of the days and nights behind me, I can still see them so very clearly. Of the times when the cot was on it’s highest setting and Eva would come in and stroke her face, the look of pure love and wonder from one face to another, with no idea of what was to come but pure love in their eyes which is enough to melt my heart over and over again and I wonder how they ever didn’t have each other. The time when Roma started to pull herself up still so little and would play peekaboo through the bars giggling at the mere sight of us on the other side. 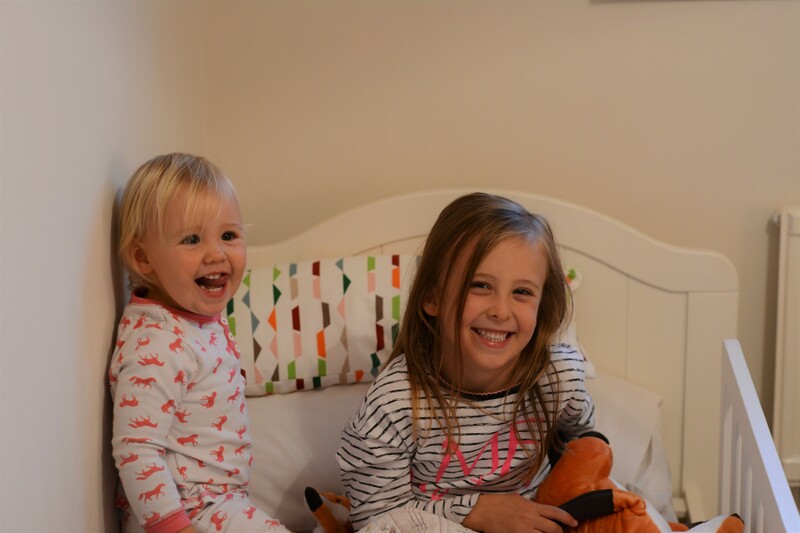 Or the time that I heard giggling coming from her room to find both of them in the cot, grins as big as they could get. There are so many moments that are etched on my brain from that cot, from this room. Some amazing and some downright exhausting as I stand with heavy eyes at 4 am rocking a baby only for her to wake again as I put her down, to lean over the cot still feeding in an attempt to settle her and wonder what happened to me! Where I would look in wonder as she was finally asleep and looked so peaceful, until I dared to place a tentative foot on that creaky floorboard and her eyes ping open and stare at me. But no matter how hard those days were, these days still are sometimes, I walked out of that room with a full heart and a big smile. All this is good and well but then the night came and it was ready to see if this would be a success. 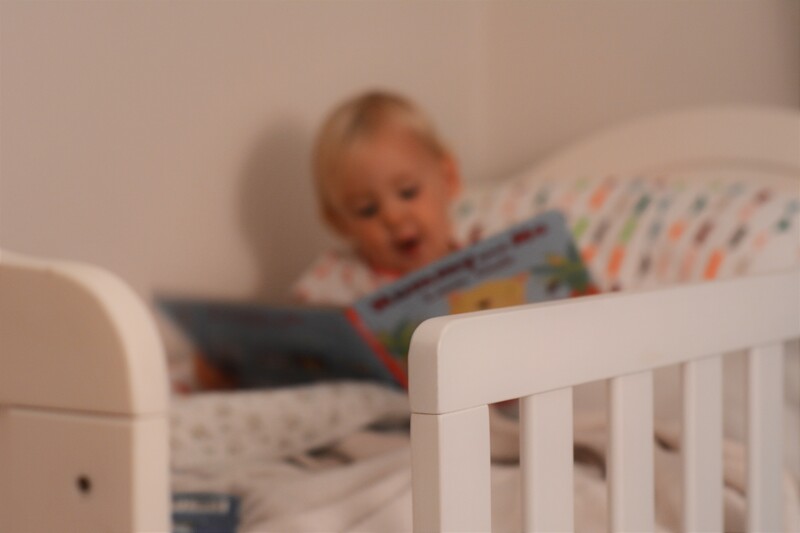 I hear the familiar sound of Eva reading to her, yet it isn’t coming from the usual place. I peek around the door of her room and they are sat as close as can be, Roma listening intently, hanging on the every word of the No-Bot. I stand there on the landing out of sight and listen to the most beautiful sound in the world, I listen and then I walk away. I let them have their moment because as much as I want to be a part of it this is their moment together. As we all say goodnight, she doesn’t want to sit on my knee on the chair anymore, she sits on her new bed. 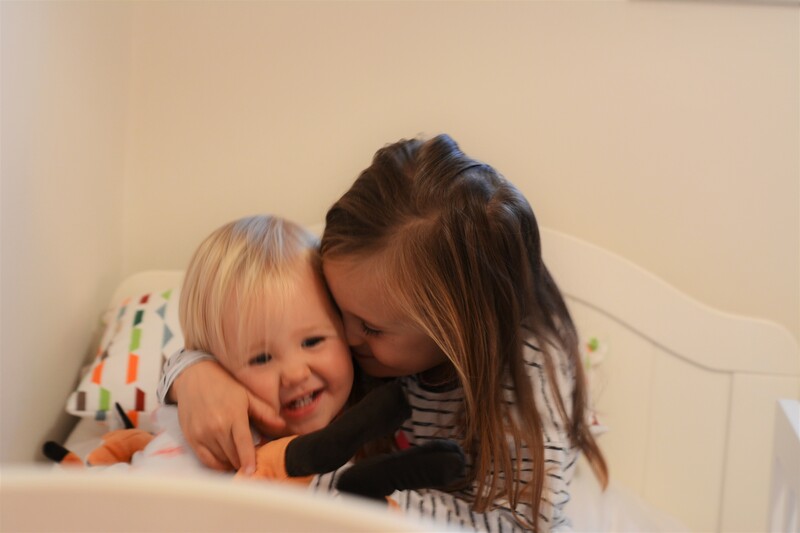 She climbs in herself and says something she has said every single night since, she exclaims in the sweetest most joyful voice – “Daddy made it. Roma happy” Her new bed I would say has been a success. It has been a week now and whilst it hasn’t been all plain sailing, she has still needed reassurance going to sleep sometimes and has still occasionally woken in the night. She has been easier to settle. She hasn’t wandered around the house at midnight, in fact she doesn’t get out at all and we have had a few nights of the glorious silent 12 hours. And every single night she has got into that bed as happy as can be. 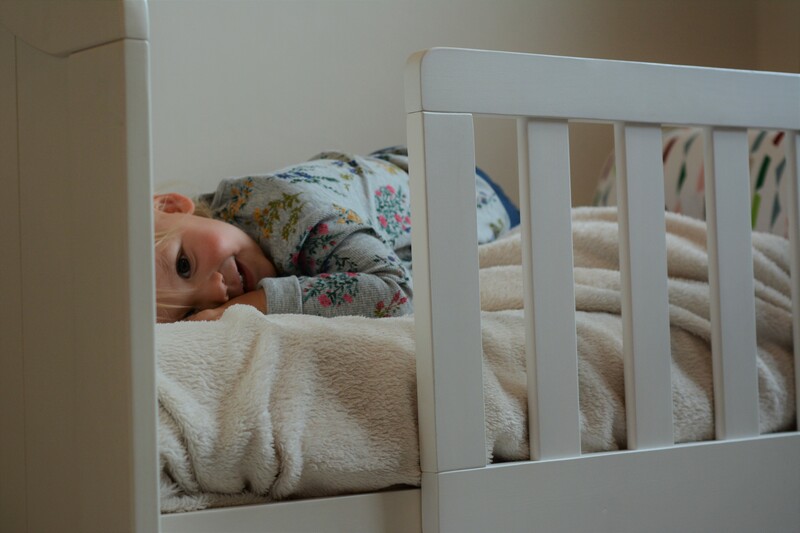 As I watch my oh so grown up 19 month old snuggle in her bed, the one that less than a week ago looked so big in that cot, now all of a sudden looks so tiny again. She has come so far, but she has a wonderful way to go. A very ordinary moment. My big girl, in her big girl bed. She still loves it, I am kind of thinking why didnt we do it sooner! Oh how wonderful that it was such an easy transition (and fingers crossed it stays that way!). She looks utterly adorable in her big girl bed, and so very little still!! She really does seem so much smaller in her bed now. It makes my heart ache! That’s a gorgeous little bed, she looks really cosy in there. Hope she sleeps a bit better in it now! Oh no I really feel for you, I had a good sleeper first time around so it has been a shock. I hope you get more sleep soon too! I am a sucker for foxes! We’re still hit and miss going to sleep (she says as she can hear her chatting away) but thankfully she still doesn’t get out! Aww she looks like such a big girl in her new big girl bed 🙂 Do you find she stays in well? My three year old is still in her cotbed and is starting to grumble about it now…I think we will need to take the side off soon!